The European Parliament has been scandalised by an incident in which 'Tommy Robinson' of the English Defence League (EDL) has personally issued a threatening letter to a British MEP inside the parliament. Robinson and other neo-nazis had accessed the Parliament, on Monday 9th July, to attend a conference organised by the Belgian far-right Vlaams Belang. Under the guise of the 'International Civil Liberties Alliance', the extremists gathered to discuss their mutual fear of Islam. The organiser, Phillip Claeys, is a board member, along with UKIP's Godfrey Bloom, of the Pan-European party, the EAF. One of the speakers at the conference was Magdi Allam, an Italian MEP who is obsessed with Islam. 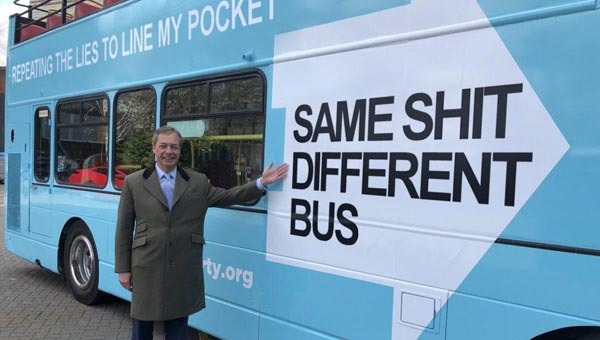 Allam is a member of Nigel Farage's EFD group in the European Parliament. As if it could not get any worse, several of the 'delegates' have been described by the press as 'mentors' of the Norwegian gunman Anders Breivik. The EAF is one of two pan-European parties to be denied further EU funding on the grounds of far-right extremist agendas. This latest incident clearly shows the cross-over between UKIP and the far-right. At his recent tribunal in London, UKIP MEP Gerard Batten was represented by a barrister, Paul Diamond, who appears to have a history of defending in court people accused of 'anti-Islamic' behaviour. He also represented Batten at the trial of Julian Assange, and Mrs Batten when she appeared in court charged non-payment of her TV licence. Through Sam Soloman, Diamond has links to the EDL. Soloman was an 'expert witness' at Batten's recent hearing. The UKIP website openly admits the links between Batten and Soloman.